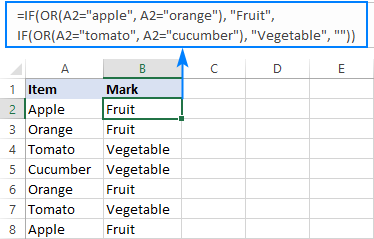 The tutorial shows how to write an IF OR statement in Excel to check for various "this OR that" conditions. IF is one of the most popular Excel functions and very useful on its own. Combined with the logical functions such as AND, OR, and NOT, the IF function has even more value because it allows testing multiple conditions in desired combinations. 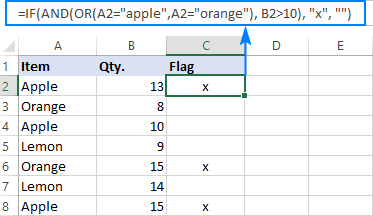 In this tutorial, we will focus on using IF-and-OR formula in Excel. In plain English, the formula's logic can be formulated as follows: If a cell is "this" OR "that", take one action, if not then do something else. 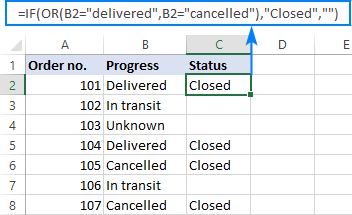 What the formula says is this: If cell B2 contains "delivered" or "cancelled", mark the order as "Closed", otherwise "Open". Should the last argument be omitted, the formula would display FALSE when none of the conditions is met. Note. Please pay attention that an IF OR formula in Excel does not differentiate between lowercase and uppercase characters because the OR function is case-insensitive. In our case, "delivered", "Delivered", and "DELIVERED", are all deemed the same word. If you'd like to distinguish text case, wrap each argument of the OR function into EXACT as shown in this example. 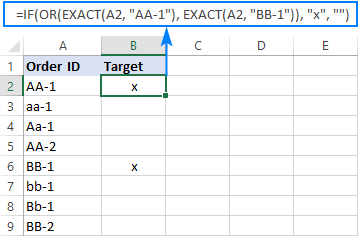 Below you will find a few more examples of using Excel IF and OR functions together that will give you more ideas about what kind of logical tests you could run. In Excel 2016 - 2007 formulas, up to 255 arguments are allowed, with a total length not exceeding 8,192 characters. In Excel 2003 and lower, you can use up to 30 arguments, and a total length shall not exceed 1,024 characters. Looking for a formula that can do something more complex than return a predefined text? Just nest another function or arithmetic equation in the value_if_true and/or value_if_false arguments of IF. Unit Price in C2 is greater than or equal to $5. As already mentioned, the Excel OR function is case-insensitive by nature. However, your data might be case-sensitive and so you'd want to run case-sensitive OR tests. In this case, perform each individual logical test inside the EXACT function and nest those functions into the OR statement. In situations when you want to test a few sets of OR criteria and return different values depending on the results of those tests, write an individual IF formula for each set of "this OR that" criteria, and nest those IF's into each other. For more information, please see Nested IF with OR/AND conditions. To evaluate various combinations of different conditions, you can do AND as well as OR logical tests within a single formula. For more information, please see Excel IF with multiple AND/OR conditions. That's how you use IF and OR functions together. To have a closer look at the formulas discussed in this short tutorial, you are welcome to download our sample Excel IF OR workbook. I thank you for reading and hope to see you on our blog next week! 13 Responses to "Excel IF OR function with formula examples"
Very good article, thanks for sharing, Keep up the good work! Hi. Can you help me. i have the following. Column Q is a sum of hours for operations. Column Y is my set hour reset. Y2 Starts at 120 hours and ends at Y23 at 2640 hours. increments are in 120 hours. In Columm Q i have the following formula =Sum(K3+Q2). on R3 i want to add a formula to do the following. Whats the best way for me to write it. 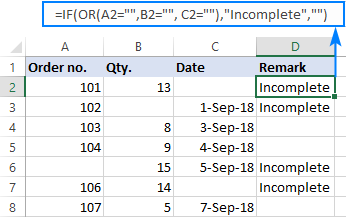 i manage to write a formula but it turns the cell in Column R when ever the statement is true "true". I agree, this makes the formula more compact. Thanks for the tip! 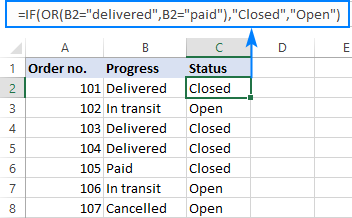 I need the response in column D , labeled "link", to substitute the number of the column with the actual entry in that column of the row. The desired results, column E, are in the "want" column. Any thoughts? I need little help to construct formula from below pseudo code. I am trying to evaluate if the first date is a weekend or the time is after 5pm. Apparently I just needed to retype and press the keyboard harder:) it worked the 50th time I typed it I don't know why as it looks exactly the same. But for now I will move on. I'm trying to write a formula using the IF, AND, or OR function but can't get the formula correct. It should be simple, really. I can't work out what I'm doing wrong, I wont paste what formulas i currently have to avoid causing a case of mass confusion.